JH Genetics number one goal is to satisfy and meet the demands of our valued customers on a worldwide basis. We thrive on the idea that a satisfied customer will return time after time to evaluate and purchase our genetics. We continually strive to offer the best of the best in the Brahman industry and nothing pleases us more than knowing that our cattle have been an asset to our customer's cattle operations. 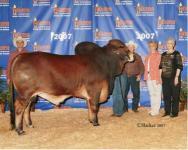 The cattle that we raise serve as a reflection of 30 years of selective breeding and dedication to the Brahman breed. Our focus has always been directed towards producing Brahman cattle that combine muscling, balance, structural correctness, and reproductive soundness with docile temperaments. We have had the distinct pleasure of exhibiting numerous champions throughout the 30 years including National and International Champions. While we feel the showring is an important tool for us to exhibit our cattle, we take pride in the fact that our cattle continue to perform beyond the showring into the pastures where today's cattlemen demand performance in order to achieve profitability. We are continually incorporating top bloodlines from the industry into our cattle in order to stay ahead of the curve and produce superior offspring. We take pride in our cattle and their quality speaks for itself. The Brahman cattle business has blessed us in more ways than one, but we are very fortunate that we have the ability to evaluate and continually mate our cattle successfully. Some of the most prestigious cattlemen from around the world have indicated to us that our cattle have tremendous toplines, clean underlines, extreme thickness and sound feet and legs. We abide by the old business practices in which a handshake still means something and commitments made are carried through. 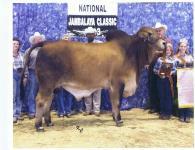 Our success in the cattle business depends upon our honesty and dependability. Every animal we sell comes with a guarantee of unsurpassed quality because our livelihood depends upon the customer's satisfaction. These beliefs have enabled us to not only market and sell our Brahman genetics domestic but also abroad in such countries as Australia, Columbia, Honduras, Africa, Guatemala, and Mexico. Our goal is to "meat" the demands of our customers. At JH Genetics we established goals for our cattle operation many years ago and hard work and determination have enabled us to produce a product that we are proud to put our brands on. 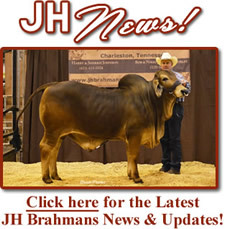 We ask that everyone sit up and take notice of the Brahman cattle wearing the JH brand because the quality truly speaks for itself and we are here to stay.